I must confess, Lori Benton isn't someone I've read a lot of. But this book intrigued me. It was the cover that first pulled me in, then the blurb sealed the deal. Well, that, and I so often hear how wonderful her books are. I'm so glad I picked this one up. Here's a short blurb, and we'll chat on the other side! Lori Benton has a way with words, and this book proves that point. This story spans nearly twenty years and is seen from many of the character's viewpoints. While that's not typical for this genre, Lori balances their voices well and uses it to pull your emotions straight onto the page. While the middle slows a tad, the beginning starts at a fast pace and the ending is more than satisfying. Another aspect that helps broaden the depth of this book is the amount of research Benton had to put into it. I love history, and this definitely dug into the setting she used without once reading like a dry history book. It was rich, colorful, endearing...and I could definitely see why so many people are fan's of Benton's books. 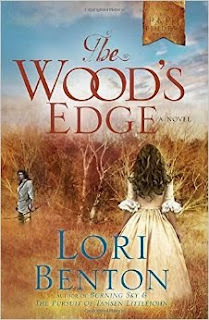 I happily give The Wood's Edge 4 out of 5 stars and you can purchase it here.